A BID to transform a Belper car park into a community allotment has divided the town council. Environmental group Transition Belper wants to create a garden for people to grow vegetables, herbs and fruit in the car park at St John’s Chapel. A spokesperson from the group said: “There is a shortage of allotment space in Belper. “The idea is to find a piece of land and if there is no soil available, builders’ tonne bags can be used. “This is a very easy, quick and temporary solution to the shortage of growing space. Tesco’s property managers have also agreed for a community garden to be created on derelict land at the former Sylcoto site. The application was accompanied by an explanation of the scheme which sees polypropylene bags filled with compost and connected to neighbouring water supplies, while a water tank collects the run-off. The council uses the car park for their meetings. Cllr Joe Booth said: “I have never read anything so ridiculous. “Where are they going to get the water and put the rubbish?”, while Cllr Jim Anderson declared the scheme a ‘non-runner’. Despite the objections, some felt it was a worthwhile use of the facility. He noted the change of use would cost £890 plus VAT and that there was no security at all. The application was refused by a narrow margin of five votes to four. 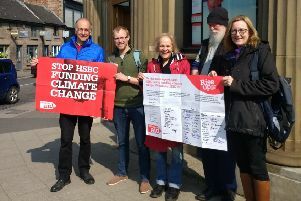 Despite this, Ian Jackson, chairman of Transition Belper, said: “We are very keen to do this, we have not really formulated a plans as of yet, we are just gathering interest. “The council has been looking for sites around the town, and it’s no secret there is a shortage of allotments – the council has been pleading with landowners.